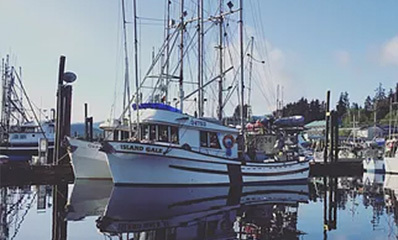 Port Hardy’s strategic location along the Central Coast of British Columbia attracts fishers of all gear types to Hardy Bay to deliver their products and re-supply vessels. Seiners, packers, deep-sea trawlers, aquaculture vessels and tugs increasingly use the Seine Float docks. Recent $6.3 million in upgrades resulted in Port Hardy being named Small Craft Harbour’s “Harbour of the Year” for 2009. Improvements included increased ease-of-access to local fish processing plants, as well as added additional supporting infrastructure such as a new concrete drive-on float system which allows service vehicles to deliver directly to the vessels. Extensive upgrades were also made to the uplands adjacent to the float system. Because of these ideal conditions for the commercial fishing fleet, Port Hardy receives more than 50% of the wild fish caught on the coast. All five species of salmon (chinook, coho, sockeye, chum and humpies) pass through these waters every year. Rockfish, groundfish, halibut and lingcod are also in the waters year round. Commercial fisheries create 8.3 million in wages and employ over 300 people in the region. Companies like Keltic Seafoods do custom processing orders for other companies.